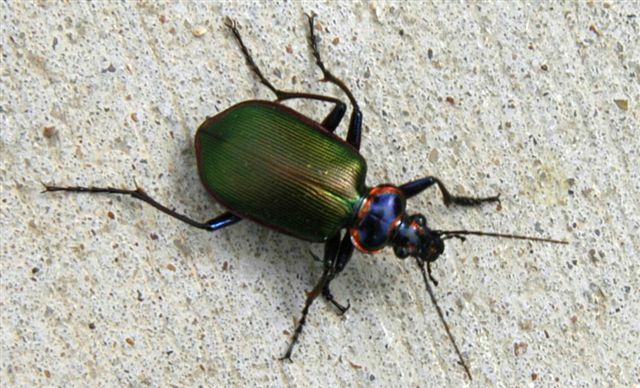 Identification: Dark, sometimes metallic-colored, shiny, fast-moving, ground-dwelling, long-legged beetles. Adults have long threadlike antennae. Some stink when handled. Many have prominent eyes. Some have grooves or pits on the forewings. Those active at night are often black. Day hunters are sometimes brightly colored. Head and thorax often narrower than the abdomen. Larvae are slender, slightly flattened, and tapered at the tail, which has two hairlike projections. The caterpillar hunter (Calosoma scrutator) is a striking brilliant metallic green beetle that kills caterpillars both on the ground and up in plants. Biology and life cycle: Eggs are laid in the soil. Predaceous larvae are segmented and tapered toward the tail. Larvae have large jaws and eat insects, as do the adults, which may live two to four years. Over-wintering adults emerge from the ground in the spring from a pupal cell and lay their eggs. Larvae hatch and feed on insects and slugs for two to four weeks and then pupate in the soil. One generation per year. Complete metamorphosis. Habitat: Most vegetable crops, especially root vegetables, onions, and potatoes. Under stones and debris. Active mostly at night. Like perennial beds and permanent plantings. Feeding habits: Both larvae and adults eat caterpillars; the Colorado potato beetle; larvae, pupae, and eggs of root maggots and flies; larvae of imported cabbage worm; diamondback moths; cutworm and cabbage loopers; aphids; asparagus beetles; slugs; flea beetles; and snails. Come to think of it, they feed on many of our most noxious insects. Economic importance: Control of many troublesome pests. Natural control: None needed. These are very beneficial insects. Insight: Hedgerows are important habitat for ground beetles. Over 2,000 native species. Ground beetles can be attracted by planting perennial beds to give them stable habitats. White clover also provides excellent habitat.